Within a day of their launch, five-room and multi-generation flats in Bidadari have become the hottest properties in the Housing Board's latest sales exercise. There were already 408 applicants vying for just 236 such flats as of 5pm yesterday - an application rate of 1.7. Four-room flats were also popular, with 601 applicants chasing 800 units. Applications close on Tuesday. Property experts named its central location in Toa Payoh as the main reason the project, Alkaff Oasis, will be the most coveted in this launch. 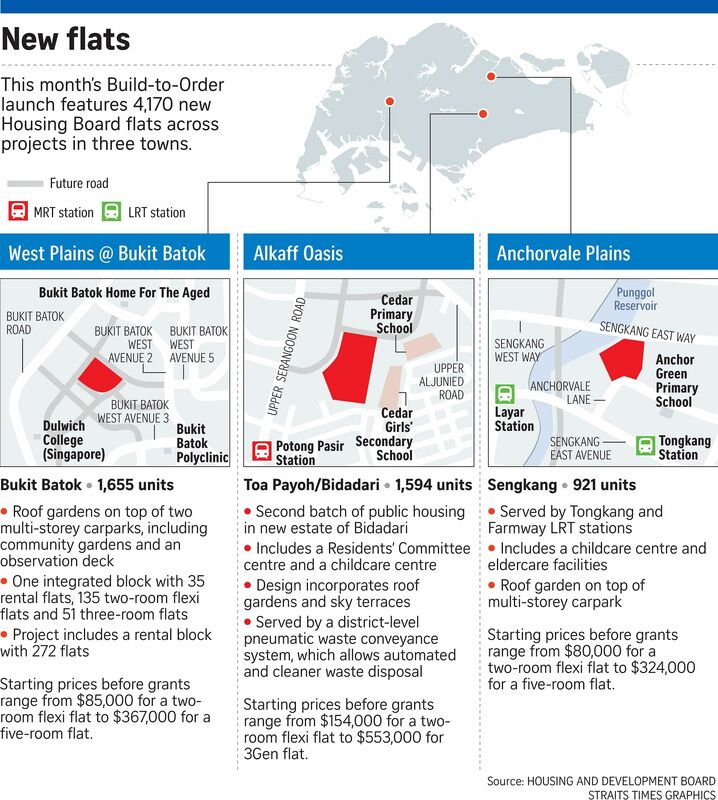 The launch, comprising a total of 4,170 flats, also offers units in the newer estates of Bukit Batok and Sengkang. Alkaff Oasis - the second lot of public housing in the upcoming Bidadari estate - is also attractive because of its proximity to established schools such as Cedar Girls' Secondary School, said R'ST Research director Ong Kah Seng. He said: "Flats in Bidadari are appreciated by aspiration-driven flat applicants who see it as akin to... upmarket flats in mature estates like Bishan and Queenstown." ERA Realty key executive officer Eugene Lim, however, said some young couples might prefer flats in Sengkang and Bukit Batok as they are less pricey. Prices before grants for five-room flats start from $546,000 in Bidadari, $367,000 in Bukit Batok and $324,000 in Sengkang. With grants, a two-room flexi flat in Sengkang could go for as little as $4,000 - the cheapest in this sales exercise. While two-room flats are open to all eligible applicants, they can also now come with a shorter lease for applicants aged 55 and up. Among the two-room flexi flats on offer, those in Sengkang were the most sought after as of yesterday, with 345 applicants vying for 448 units. The application rate for these flats was highest among singles, rather than older buyers eyeing a shorter lease. Mr Ong said this group might take a while to warm up to the idea, though it is tailored to them. "The two-room flexi scheme has yet to see massive, overwhelming applications by the elderly, as generally the elderly of today are still quite conservative. They resist uprooting to a new flat." Bank analyst Jeremy Ho, 26, plans to apply for a four-room Bidadari flat with his 25-year-old girlfriend. They were unsuccessful in their past four bids. "Money is one consideration. A five-room flat there starts from over $500,000. I would rather pay less for a four-room and spend more on renovation," said Mr Ho. He hopes this strategy would also raise his chances. There are 800 four-room units on offer in Bidadari in this launch, compared to just 165 five-room flats. The price premium that comes with living in Bidadari does not bother Mr Ho, who works in Raffles Place. He said: "You are not paying more for nothing. You save time travelling. Location ultimately trumps everything."